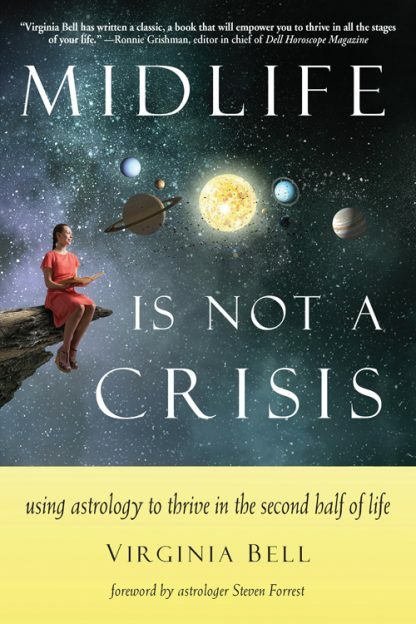 Midlife Is Not a Crisis combines astrology, inspiration, and wisdom about aging to empower people to live more fully in the second half of life. It is based on the generational life cycles we all share at certain ages, from the Saturn Return at 29 and Midlife, which peaks at 42, all the way to the Uranus Return at 84. These cycles are the great crossroads of life, and each cycle is a journey in itself. Strung together they offer a road map to life�s most challenging and rewarding passages. In every decade there are trials, lessons, and losses; in this we have no choice. Our freedom lies in how we respond�consciously or unconsciously, awake or asleep. The planet that governs each cycle acts as a wise elder or guide and holds the key to navigating the cycle successfully. This book tells the story of these cycles and provides a guide to living consciously and well. We are aging differently from the way we did in the past�we are not only living longer, we are staying healthy and vital longer as well. Midlife Is Not a Crisis motivates people to grow and prosper at any age. Ultimately it is a practical guidebook for our later years that shows us what to expect as we age and helps us make the most of our journey to becoming whole. Virginia Bell has been a full-time astrologer since the 1990s. She currently writes a horoscope column and celebrity profiles for the CBS magazine, Watch!. She�s a regular contributor to the Huffington Post and has written astrology columns for magazines including TV Guide and US Weekly. Visit her at www.virginiabellastrology.com.